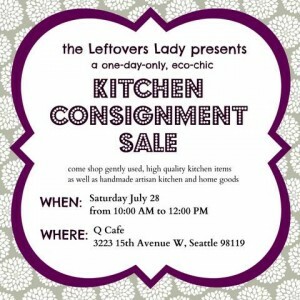 A group of Seattle foodies are selling a bunch of new or slightly-used kitchen goods, and though the event is in Magnolia, 10% of the proceeds will benefit the Beacon Hill Food Bank. Appliances, dishes, gadgets, linens, canning supplies, utensils, and more will be available for sale. The sale is brief — 10 a.m. to noon this Saturday, July 28 at Q Café in Magnolia, 3223 15th Ave. W.
See more information and pictures of some of the items to be sold at the event’s Facebook page. Previous PostMan arrested in shooting at 15th and CollegeNext Post“Save the Whale” at this month’s Beacon Rocks!